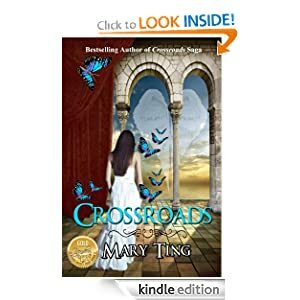 Crossroads Now Free on Kindle! I thoroughly enjoyed this book. For me it was quite an emotional read. I had recently lost a dear friend of mine, just as Claudia had. Her emotional breakdown during the funeral had me in tears because I so closely related to it. The depth of feeling that Mary Ting puts into her work is simple amazing. I also appreciated the budding romance, which started timidly but became a small whirlwind that swept Claudia away, without completely over doing it. It hints that there may be more passion to come, but never crossed the illicit boundary into adult romance, which keeps this still quite safely in the young adult range. I feel that anyone can read this book and understand the religious archetype that Ms. Ting presents. You do not have to be strictly any religion to relate or understand the mythology that is set up. You also do not have to be a young adult to enjoy this book. It was a quick read for me and that is usually a sign of an author I will read again, for Ms. Ting kept my attention and entertained me throughout. I personally appreciated the dialogue and vocabulary in this book. I am so tired of reading books that have been dumbed down for the younger audience. Why do we not have higher expectations for our youth? I would expect my own child to be able to function higher than some twitterpated fool in love with some clichéd work that doesn’t teach her to broaden her horizons. How many times can we read the same regurgitated material, before we become mindless zombies that cannot think for ourselves? I’m dreading the day that my child wants to pick up a book simply because everyone says it’s the hot new thing. I guess I’m anti-mainstream phenomena. Ok, end rant. I just had to get that out! And I am so thrilled to add Ms. Ting’s books to the list of material I would recommend for my child when she is older.